Copyright Reform. It’s a few votes away. The European Union may require those who share news to obtain licences first (permissions against payment). The European Union may require platforms to filter content uploaded by users (aimed at music files but also affecting other forms of digital expression). What is the evidence for such radical measures? This resource tracks the progress of the European Commission’s Reform Package through the complex EU process of law making. 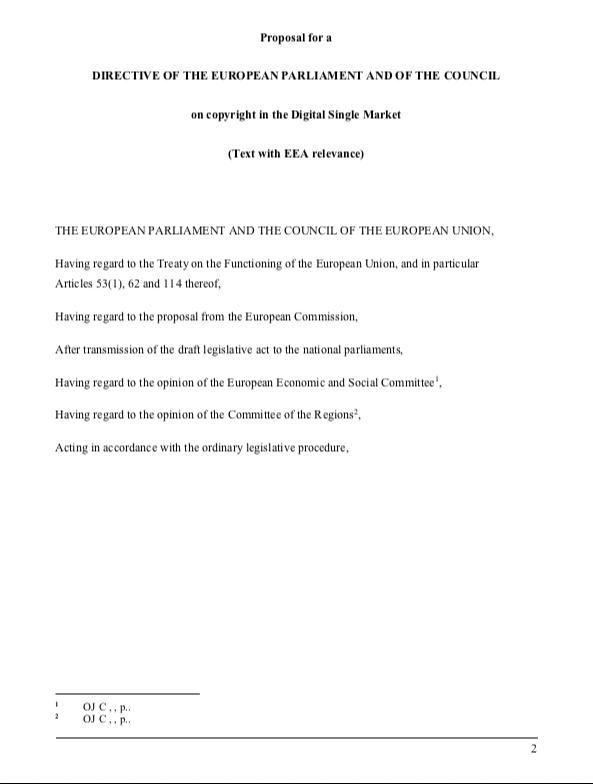 Official version of the trilogue agreement that was adopted by Parliament in the plenary session on 26 March 2019. The articles have been renumbered. Article 11 becomes 15; Article 13 becomes 17. Following trilogue negotiations throughout Winter 2018/2019, this is the text agreed upon by national governments at a COREPER meeting of 20 February 2019, and endorsed by JURI on 26 February 2019. A multi-column document detailing the original positions of the Commission, Parliament and Council, with the agreed compromise text detailed in the fourth column. 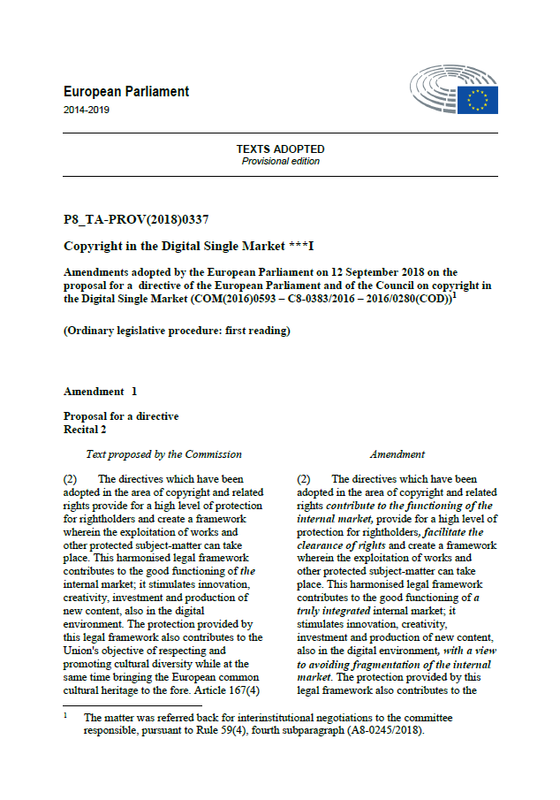 The original Copyright Directive Proposal as published by the EU Commission on 14 September 2016. 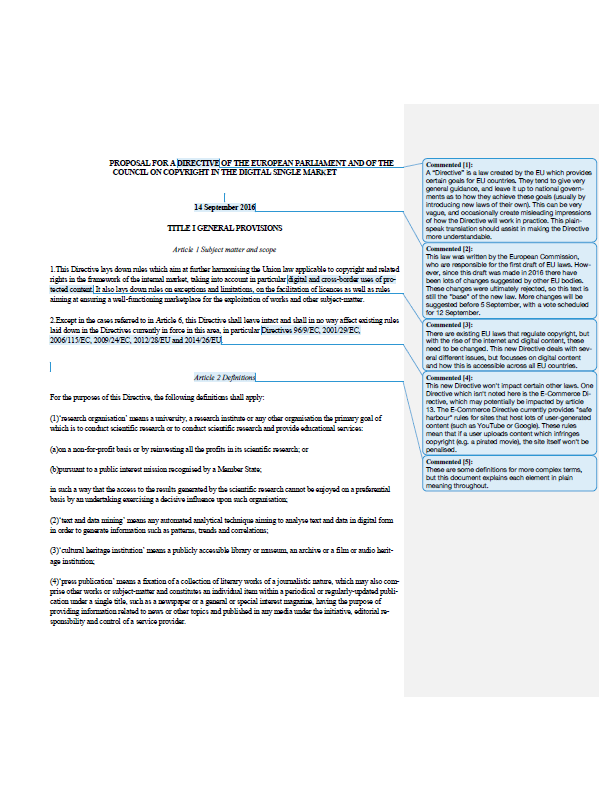 A plain speak/plain English translation of the articles of the Original Commission Proposal, produced by CREATe. The position agreed by the EU Council, dated 25 May 2018, granting a negotiation mandate to the (then) Bulgarian Presidency. The position adopted by JURI, dated 29 June 2018. This position was rejected at the plenary vote of the European Parliament on 5 July 2018. Plenary amendments adopted by the EU Parliament on 12 September 2018, granting a negotiation mandate to rapporteur Axel Voss. A progressive alternative: Unsuccessful amendments tabled by a group of MEPs from ALDE, S&D, EPP and ECR on 6 September 2018. Following the adoption of a position of the Council of the European Union on 25 May 2018, the European Parliament’s Legal Affairs Committee (JURI) narrowly voted in favour of the key provisions of the proposed Copyright Directive on 20 June. It also gave a mandate to Rapporteur MEP Axel Voss to start trilogue negotiations with the Council and Commission. A full plenary vote by the European Parliament on 5 July 2018 challenged the JURI vote, and rejected the negotiation mandate and JURI report with 318 to 278 votes (and 31 abstentions). On 12 September 2018, the Parliament finally adopted a position on the Copyright Directive, with 438 votes in favour, 226 against, and 39 abstentions. Amendments drafted by Rapporteur Voss on behalf of the centre-right European People’s Party (EPP) secured a majority: Article 11 (Press publishers right) with 393 votes to 279, and Article 13 (New obligations for platforms) with 366 votes to 297. 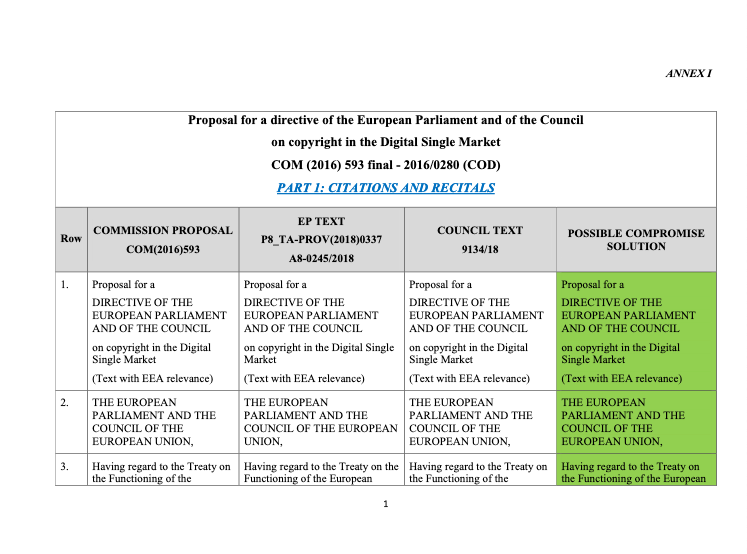 Most of the original language of each of these provisions remain intact, and a side-by-side comparison of the original Commission text vis-à-vis the agreed amendments is available here. A video of the press conference following the vote is available here. There will be a final vote after the trilogue negotiations, anticipated for Spring 2019. It is rare for a plenary vote to reject proposed legislation that has reached an advanced stage. The Anti-Counterfeiting Trade Agreement (ACTA) in 2012 is such an example. The graph below details the legislative process from 2016 (first draft) to 2021 (anticipated date of implementation into domestic law). Copyright law is subject to intense lobbying. This is an important junction in copyright policy, as the Copyright Directive could be the most far reaching European copyright intervention since the 2001 Information Society Directive. CREATe believes that we can actually know who is right, and who is wrong. The evidence is available. This resource page signposts significant independent scientific research. It also offers a timeline of the policy making process for the Copyright in the Digital Single Market directive, and access to draft documents where they have become available (sometimes as leaks). The recent wave of copyright reform began in 2014 in an optimistic mood. “You should set clear long-term strategic goals to offer legal certainty to the sector and create the right regulatory environment to foster investment and innovative businesses. You should also ensure that users are at the centre of your action (…). They should be offered access to services, music, movies and sports events on their electronic devices wherever they are in Europe and regardless of borders”. “Copyright rules should be modernised, during the first part of this mandate, in the light of the digital revolution, new consumer behaviour and Europe’s cultural diversity”. On 14 September 2016, the European Commission published a package of reform proposals. It is a complicated package, supported by over 400 pages of Impact Assessments. 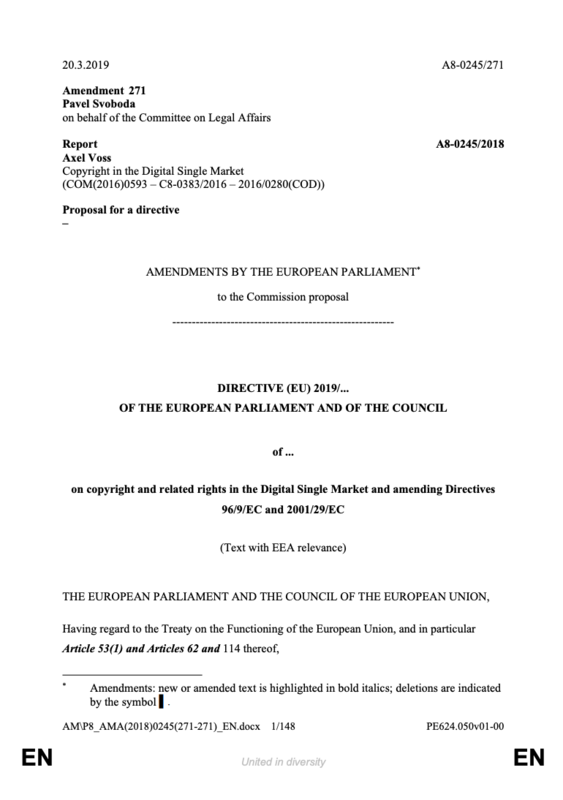 Progress of the Copyright in the Digital Single Market Directive (COM(2016) 593 final – the most important intervention) can be followed on the timeline below. Martin Kretschmer’s blog post summarises the position as of 11 May 2017 (available here).. The full text of the Commission proposal is available here, with opinions by Internal Market, Industry, Culture and Civil Liberties Committees also available. The Legal Affairs Committee Draft Report is available here, with details of over 1000 proposed amendments. A better functioning copyright marketplace. Apart from the Copyright in the Digital Single Market directive, the copyright package also includes legislation on the cross border portability of online subscriptions for content: Regulation (EU) 2017/1128 on cross-border portability of online content services in the internal market(14 June 2017), a “SatCab” Regulation on the exercise of copyright and related rights applicable to certain online transmissions of broadcasting organisations and retransmissions of television and radio programmes (COM/2016/0594 final – 2016/0284 (COD)), and provisions implementing the Marrakesh Treaty to Facilitate Access to Published Works for Persons Who Are Blind, Visually Impaired or Otherwise Print Disabled. And there is a proposal to amend the Audiovisual Media Services Directive (AVMSD) published by the European Commission on 25 May 2016. Legislative progress can be followed here. Links to media coverage of the Directive from across the EU and internationally, from 24 May 2018 to 19 Sept 2018. 26/06/2018 High Snobiety Could a New European Law Mean the End of Memes? 02/07/2018 Kauppalehti T&T: Teknologiateollisuus arvostelee kovin sanoin EU:n tekijänoikeusuudistusta – "Ei mitään myönteistä"
04/07/2018 El Pais Propuesta de Directiva de copyright: ¿el fin de la “brecha de valor”? 06/07/2018 BBC Tech Tent – did Silicon Valley win the copyright war? 06/07/2018 infojustice.org Andres Guadamuz: What can the copyright directive vote tell us about the state of digital rights? 10/07/2018 La Liberation Directive droit d'auteur: la régulation au prix de la répression ? 10/07/2018 La Liberation Directive sur le droit d’auteur : protectrice ou liberticide ? 26/06/2018 HRT Vijesti Nova direktiva o autorskim pravima - Copyright ili cenzura? 09/09/2018 Süddeutsche Zeitung Ein Kampf um die Aufklärung: Das EU-Parlament verteidigt heute das Recht gegen die Digitalkapitalisten von Google und Co.
10/09/2018 HRT Vijesti Europska direktiva o autorskim pravima: za ili protiv? 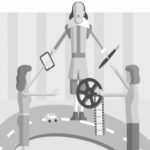 11/09/2018 Libération Droit d'auteur: Comment faire payer les Gafa ? 12/09/2018 Libération Quelle est la position de Libé sur la directive concernant le droit d'auteur ? 12/09/2018 Süddeutsche Zeitung Grenzen für Digitalkonzerne: Die europäische Politik zeigt, dass sie dem Digitalkapitalismus Grenzen setzen kann. 13/09/2018 Shortlist So, what exactly is the EU's new 'meme-killing' law, and why does it affect football fans? 18/09/2018 Copenhagen Post EU’s Copyright Directive: the end of a free internet or justice for artists? “… Thank you very much chair. Ladies and gentlemen, colleagues […]. This is a decisive issue; namely, to what extent can we translate our concept of copyright into the digital age? How can we adapt it to a digital age? Do we want to protect our intellectual property in the form that we’ve done so far? And what is copyright? For whom does it serve? Do we want to set up a legal framework for the internet here so that content creators are not swindled? That is the basic issue that we’re dealing with today. And we need to weigh up these issues and balance them against freedom of expression and copyright theft – those are decisive issues. Those are the issues at stake here. Do we want to allow the internet complete freedom, or do we still protect our values? I know that there has been a discussion on Article 13 which has become infamous, and everything is hanging on that Article, but I would also briefly like to speak on some of the other issues which we’ve enshrined in this report. Firstly, we have a modern system of text and data mining. Commercial text and data mining is being implement by the report and that’s progressive, and I believe it will also be the first step worldwide in that direction. Article 12 creates a possibility that the Reprobel case, the Court of Justice ruling, that that ruling is rebalanced for those countries which are affected by that ruling, for book publishers and authors of books. For actors, for creative artists, for artists in general, we have helped them through Article 14 and following. We’ve created possibilities for them to improve a fair situation with respect to publishers, music labels etc. without creators having to go to court all the time. So again, it will improve the relationship between them. Article 11 establishes a possibility that our press publishers will have better neighbouring rights, and that’s what we’re doing here in the article. We’re only giving them a right to do something – what they do with that right is then up to them. But it establishes a more level playing field with respect to internet platforms. Because the way the internet has developed over the past few years means that if it’s on the internet people think it’s free. Then that content is used in such a way that publishers can’t monetize that content. If you look at Article 13 there have been many allegations, or accusations, of the fact that we have created a definition where we only include those platforms which precisely know that they do use content which belongs to others, which is under copyright to others, and monetize that content. So, the question is how you can implement these rules for platforms which invite users to upload whatever they like. That means the platforms need to have a responsibility, and we want to give them that responsibility today. To deal responsibly with copyrighted content of the rightsholders, which are not those platforms, and that is the issue at stake today. Madam President, I would like to thank the honourable Members of the European Parliament for this debate. Many speakers spoke about upload filters today. To be clear, upload filters are not mentioned in the text of the directive, but as we all know they are already used by big platforms. Voting down the directive will not take away upload filters. The directive will, on the contrary, give our citizens of the right to ask for reuploads and contest removals of content that they should be able to upload. This is a major improvement on the current situation. The vote on the copyright directive is about Europe’s message to its creators. It is simple, we care about you and we protect you so that you continue your invaluable work and contribution to our culture. Culture is what European societies are built on. It is at the source of our values and our inspiration. The ultimate beneficiaries of this directive will be Europe’s citizens. A modernised legal environment for copyright will improve their access to European arts, entertainment and quality journalism. This vote is also about the EU’s ability to tackle the complex and important legal challenges of the online environment. We understand that there are different voices and different opinions. This is normal in such an important debate. We have listened to the different views and respect all of them. However, we believe that the text resulting from the trilogue is balanced and delivers on our objective to modernise European copyright law. 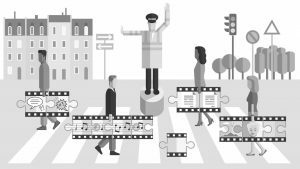 It is time to step up and make European copyright law fit for the digital age. Thank you President, thank you Mr Voss and shadow rapporteurs, thank you honourable Members. “… Ladies and gentlemen, there are three things in the debate on copyright that have been hitherto unknown. First of all, 200,000 people this weekend demonstrated against this reform. Five million have signed a petition against upload filters. There’s never been such a broad protest against an EU directive. “Thirdly neither the union nor the opposition [SPD] actually think this is a good reform. No one wants to take the political responsibility for these upload filters that are part of Article 13. But the federal government is still going to vote in favour. 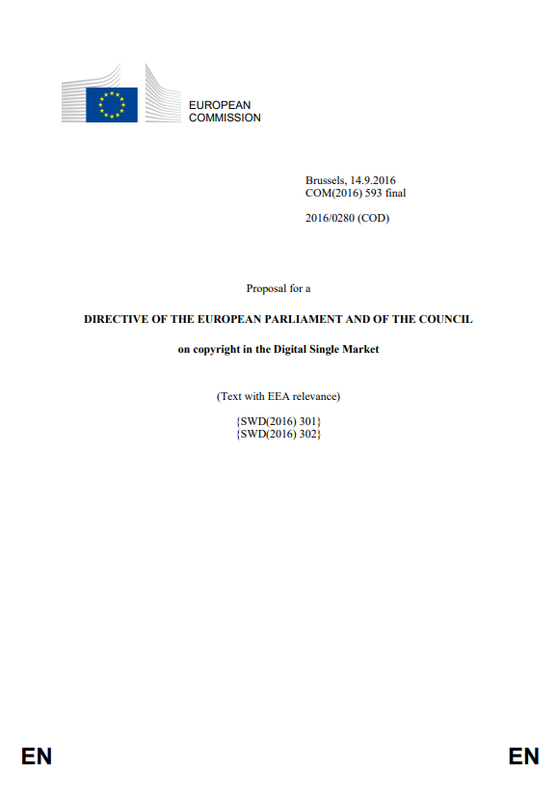 Transcription of the Plenary discussion on Copyright in the Digital Single Market. Chairs: Pavel Telička & Rainer Wieland. 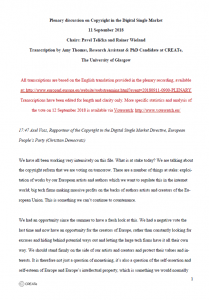 Transcription by Amy Thomas, Research Assistant & PhD Candidate at CREATe, The University of Glasgow. View and download here (30 page pdf). “I would like to thank the members of the European Parliament for this interesting debate. It’s very evident that there is a clear consensus about the need to modernise the EU copyright framework. Reform of copyright is extremely difficult to do, we all know this. There are so many interests to reconcile and the rules have direct impacts on the everyday lives of our citizens. I think it’s good to remind ourselves that this Directive is important for the many reasons mentioned before. The European citizens care about this Directive in a very direct way. We saw this when the Commission worked on its proposal, and we have seen it leading up to this debate. Clearly, we need to give Europeans the right kinds of copyright laws for the digital age. They deserve nothing less. And it is achievable. This is very clear to us after this debate. As mentioned before none of the proposals now on the table will destroy the internet nor freedom of speech. None of the proposals will restrain our citizens from expressing themselves or sharing their ideas with others. More specifically rest assured that article 11 will not limit access to information. On the contrary, it will ensure the survival of quality press in the digital age. And as for article 13, I think we only need targeted and balanced intervention to ensure the European creative industry can get a fair share of the value generated by its content which is nowadays mainly used online. Prior to the plenary vote on 5 July, short speeches were given by JURI rapporteur Axel Voss and IMCO rapporteur Catherine Stihler (IMCO, the internal market committee, shares responsibility for Art. 13). “Thank you very much Chair. We’ve all had very intensive discussions but what is it that we’re talking about with this reform? It’s an end of the exploitation of European artists on the internet, we’re talking about the major US platforms like Google and Facebook that have been making huge profits at the cost of European creatives. We need to prevent that and I think it is inexplicable how some people want to support this internet capitalism. While others are calling for America first and abusing data and exploiting creatives, we should be standing at the side of our European creatives otherwise there is a risk of creative insolvency. With these reforms we’re also talking about existing legislation, copyright and ownership ensuring that we have the right balance. Why would we be against wanting to prevent copyright violations? Why would we be against fair remuneration of creatives and getting these large platforms to take more responsibility? “Thank you Mr President and colleagues. I want to thank everyone for the work they’ve done on this important file. We’re all united in our shared mission to protect artists and cultural diversity in Europe, and I speak as Rapporteur in the IMCO committee, which is the only committee to share joint competency on one of the most controversial articles, Article 13. In our committee we’re able to reach a broad compromise that makes meaningful progress on the value gap while at the same time safeguarding the rights of European internet users, SMEs and start-ups. I deeply regret that the IMCO position has not been taken into account and the JURI text does not achieve the needed balance. There are real concerns about the effect of Article 13 and freedom of expression raised by experts ranging from the UN Special Rapporteur David Kaye to the inventor of the worldwide web, Sir Tim Berners-Lee and the real concerns voiced by our citizens. Just yesterday I received a petition signed by almost a million people against the JURI committee mandate and although there’s consensus and I believe there is consensus about the goals behind this law, huge controversy still exists about the methods proposed. Something’s not right here. We owe it to the experts, stakeholders and citizens to give this directive the full debate necessary to achieve broad support. Dear colleagues I ask you to refuse to fast track this law to allow for a broad fact-based debate in September. Please reject the mandate and vote against the JURI proposal. European Policy for Intellectual Property (EPIP) is the leading scientific association for the economics and law of Intellectual Property. The EPIP 2018 conference was held in Berlin, 4-7 September 2018, where this statement was drafted. On Wednesday, 12 September 2018, the European Parliament will vote in plenary session on the heavily lobbied proposed Directive on Copyright in the Digital Single Market. On 5 July, a previous plenary vote rejected the report by Axel Voss MEP, the rapporteur for the legal affairs committee JURI. The main concerns related to the effects of Article 11 that introduces a new layer of licensing into the communication of news online, and of Article 13 that introduces new obligations on online platforms that are likely to be met by filtering content uploaded to their services. 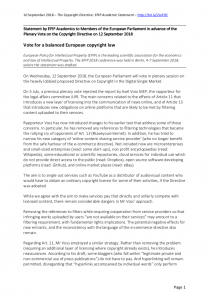 This academic statement was released in anticipation of the plenary vote in the European Parliament on the Copyright in the Digital Single Market Directive, scheduled for 5 July, 12:00. Click here to read statement & download pdf. There is no independent research that supports this proposal. None at all. There is scientific consensus (expressed here by over 200 European academics) that Article 11 will create very broad rights of ownership in news and other information. This will impede the free flow of information that is of vital importance to democracy. In economic terms, Article 11 is likely to favour incumbent publishing interests rather than innovative quality journalism. A less invasive solution, improving publishers’ ability to sue, is readily available. This amendment is supported by a cross-party group of MEPs. It should be noted that journalists themselves are not in favour of the new right, and there is no evidence from countries that have introduced a similar right that revenues have reached journalists. See Bently and Kretschmer’s study for the European Parliament. It is also evident (supported by an analysis of the policy time line) that there has been a lack of accountability in lobbying. While the European Parliament’s initial rapporteur MEP Therese Comodini Cachia (EPP) (who resigned in June 2017 to take up a seat in the Maltese parliament) reported her meetings with interested parties, the current rapporteur MEP Axel Voss (EPP) seems to keep a hidden line to German media interests. The mainstream legacy media have been reluctant to report critical voices. They have in effect muzzled their own journalists. Not a good sign for a proposal that is to serve a pluralist press. Research relating to Article 11 can be found here. The goal of the proposed exception for text-and-data mining is laudable. Data analytics, including applying machine learning (AI) techniques, is a fast moving technology. Legal certainty to stimulate research and innovation should be welcome. There is academic consensus that the proposed exception falls short. 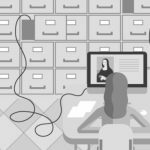 Extracting the information contained in copyright works should not be a copyright infringement in the first place. Text-and-data mining does not use the work as a work. See also Opinion of the European Copyright Society. Therefore the proposed exception should simply clarify that ALL who have lawful access to a work can perform text-and-data mining without asking for further permission. Instead, Article 3 offers complicated wording, limiting both the beneficiary and the purpose, and offering no safeguards against technical obstacles. The evidence suggests that this intervention will do nothing to increase European engagement with data analytics. Countries with open, flexible exceptions capable of responding to new technologies will be better off. See Geiger, Frosio, Bulayenko (2018): The Exception for Text and Data Mining (TDM) in the Proposed Directive on Copyright in the Digital Single Market. Research relating to Article 3 can be found here. The proposed filtering obligation for online services to which users upload content is designed to increase the bargaining power of rightholders versus intermediaries, such as YouTube (owned by Google) or Facebook. In a discourse dominated by the music industry, this has been termed as a provision closing the “value gap”. There is a case for regulating the power of online platforms but we first need a correct diagnosis why bargaining for some rightholders has become more difficult. The music industry has been perfectly able to negotiate licences with services such as Spotify and Apple. The fact that less money has found its way to musicians while the overall music market is increasing points to a different “gap”. This is where interventions may need to be examined. 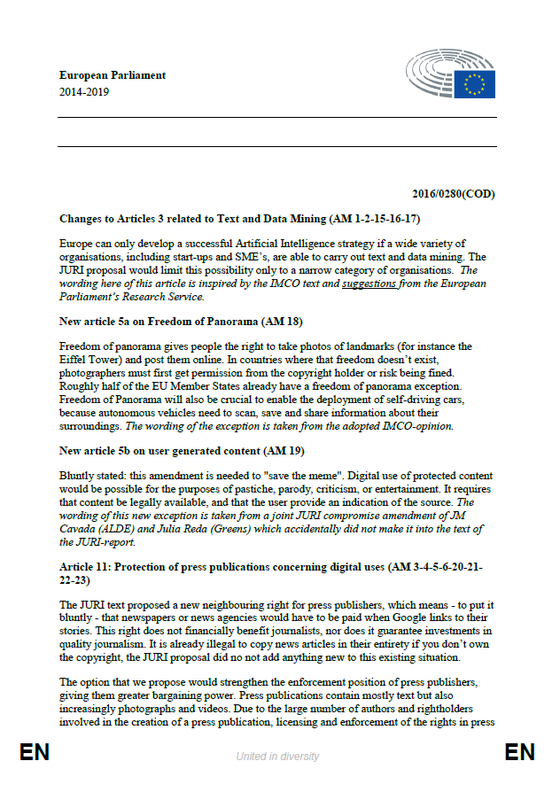 Academics agree that Article 14 requiring greater transparency of information about the exploitation of works and performances is a promising start. There is evidence that points in different directions regarding equitable remuneration rights for authors and mechanisms for the regulation of contracts: IViR (2016); Bently & Kretschmer (2017); Xalabarder (2018). In the case of user-generated content (Art. 13), it is a mistake to rely on the specific needs of parts of the music industry (an effective lobby) to change laws without understanding past interventions. In the EU, we have had a liability regime for Internet intermediaries for nearly 20 years that is open to empirical examination. Under the Directive on Electronic Commerce (2000/31/EC) hosts of content uploaded by users will be liable only upon obtaining knowledge of the content and its illegality. 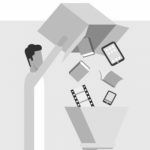 This has led to the introduction of so-called “notice and takedown” practices that have increased dramatically in complexity with the arrival of algorithmic takedown requests and Google’s ContentID technology. Despite the enormous potential economic and cultural impacts of this regulatory approach, we know surprisingly little about the effects of the current regime (“This video is unavailable“, Erickson & Kretschmer 2018). When the content to be removed is an unambiguous piratical copy, automated systems make sense (as long as the takedown request is accurate and valid, a separate problem discussed by Karaganis, Urban, Schofield). If human judgment is needed to assess the validity of a takedown request, for example in the case of content that might benefit from a statutory copyright exception, filtering obligations will make an existing problem worse. Article 13 does not reflect the principles that led the Court of Justice of the European Union to develop its case law against general monitoring. See Senftleben, Angelopoulos, Frosio, Moscon, Peguera and Rognstad (2017): The Recommendation on Measures to Safeguard Fundamental Rights and the Open Internet in the Framework of the EU Copyright Reform. In economic terms, the proposal threatens the benefits of user-led innovation for cultural practices that are rapidly changing. Under these circumstances, the right regulatory response is caution. The obligation to act upon constructive knowledge (established under the e-Commerce Directive) should not be replaced by a filtering obligation. Research relating to Article 13 can be found here. Two open letters from European Research Centres were sent to MEPs and members of the IP working party of the Council of the European Union, dated 26 April 2018 and 24 February 2017. 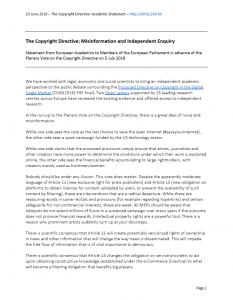 A Statement signed by over 200 European academics against the press publishers’ right was published on 25 April (and endorsed by the European Copyright Society). 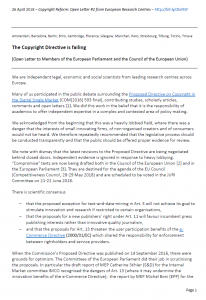 The first Open Letter (see here) offers a comprehensive review of independent evidence relating to Article 11 (creating a new exclusive right for press publishers) and Article 13 (changing the liability regime for online intermediaries relating to user generated content). 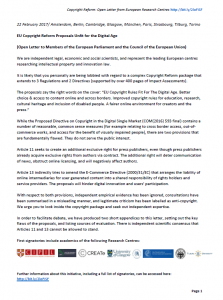 The second Open Letter (see here) identifies a scientific consensus around the benefit of a broader exception for TDM; the problematic aspects of the press publishers’ right, and the threat posed by the filtering obligations for online intermediaries. We are independent legal, economic and social scientists from leading research centres across Europe. Many of us participated in the public debate surrounding the Proposed Directive on Copyright in the Digital Single Market (COM(2016) 593 final), contributing studies, scholarly articles, comments and open letters . We did this work in the belief that it is the responsibility of academics to offer independent expertise in a complex and contested area of policy making. We acknowledged from the beginning that this was a heavily lobbied field, where there was a danger that the interests of small innovating firms, of non-organised creators and of consumers would not be heard. We therefore repeatedly recommended that the legislative process should be conducted transparently and that the public should be offered proper evidence for review. We note with dismay that the latest revisions to the Proposed Directive are being negotiated behind closed doors. Independent evidence is ignored in response to heavy lobbying. 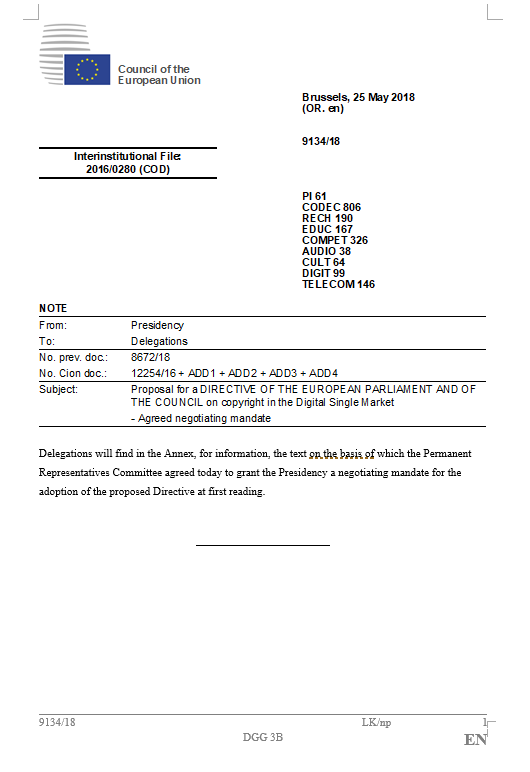 “Compromise” texts are now being drafted both in the Council of the European Union  and in the European Parliament . They are destined for the agenda of the EU Council (Competitiveness Council, 28-29 May 2018) and are scheduled to be voted in the JURI Committee on 21-22 June 2018. There is scientific consensus that the proposed exception for text-and-data-mining in Art. 3 will not achieve its goal to stimulate innovation and research if restricted to certain organisations, that the proposals for a new publishers’ right under Art. 11 will favour incumbent press publishing interests rather than innovative quality journalism, and that the proposals for Art. 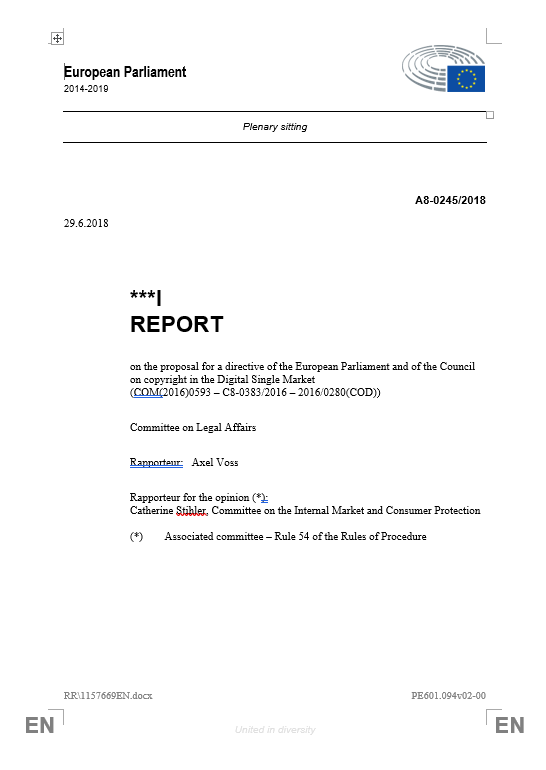 13 threaten the user participation benefits of the e-Commerce Directive (2000/31/EC) which shared the responsibility for enforcement between rightholders and service providers. When the Commission’s Proposed Directive was published on 14 September 2016, there were grounds for optimism. The Committees of the European Parliament did their job in scrutinising the proposals. In particular the draft report of MEP Catherine Stihler (S&D) for the Internal Market committee IMCO recognised the dangers of Art. 13 (where it may undermine the innovation benefits of the e-Commerce Directive); the report by MEP Michał Boni (EPP) for the Civil Liberties committee LIBE emphasised the Charter of Fundamental Rights and that Art. 13 should not impose a general monitoring obligation; the report by MEP Zdzisław Krasnodębski (ECR) for the Industry committee ITRE drew attention to the narrow scope of the proposed Art. 3 exception for text-and-data-mining. In the lead Legal Affairs committee JURI, rapporteur Therese Comodini Cachia (EPP) produced a balanced draft report, published on 10 March 2017  that replaced the deeply problematic new publishers’ right in Art. 11 with a presumption that gives press publishers standing to sue. Comodini’s report also opened the text-and-data-mining exception under Art. 3 to all, and clarified the obligations on service providers under Art. 13. Comodini resigned as a MEP in June 2017 to take up a seat in the Maltese Parliament and Axel Voss, a German MEP from the EPP Group, was appointed rapporteur. The legislative drafts that have since emerged from his office as well as from the Bulgarian Council presidency (since January 2018) pay lip service to authors’ interest but respond in effect to the agenda of powerful corporate interests. There is a tremendous amount of noise and misinformation. “Fake news” is dressed as a copyright issue (which can only be characterised as cynical), and the misleading rhetoric of a “value gap” clouds the true nature of the issues for online platforms. Comodini’s draft report for the JURI Committee in our view still offers the most workable basis for progress because it was based on wide and transparent consultation, taking into account scientific evidence. If the legislation progresses in the form proposed by the recent drafts of the Bulgarian Presidency and JURI rapporteur Voss, we call on you to reject the Proposed Directive altogether. It will not serve the public interest. The Copyright in the Digital Single Market Directive is now failing its stated goals to improve choice, access and fairness in the digital environment. We are independent legal, economic and social scientists, and represent the leading European centres researching intellectual property and innovation law. It is likely that you personally are being lobbied with regard to a complex Copyright Reform package that extends to 3 Regulations and 2 Directives (supported by over 400 pages of Impact Assessments). While the Proposed Directive on Copyright in the Digital Single Market (COM(2016) 593 final) contains a number of reasonable, common sense measures (for example relating to cross border access, out-of-commerce works, and access for the benefit of visually impaired people), there are two provisions that are fundamentally flawed. They do not serve the public interest. With respect to both provisions, independent empirical evidence has been ignored, consultations have been summarised in a misleading manner, and legitimate criticism has been labelled as anti-copyright. We urge you to look inside the copyright package and seek out independent expertise. In order to facilitate debate, we have produced two short appendices to this letter, setting out the key flaws of the proposals, and listing sources of evaluation. There is independent scientific consensus that Articles 11 and 13 cannot be allowed to stand. The full list of signatories can be found at the end of this page. Download the letter as pdf. If you support the Open Letter and wish to add your name, please send an e-mail to the CREATe hub. The Proposal aims to change the legal framework for the online use of news, by creating a new exclusive right for press publishers. Any statement that this intervention will not affect the communication of information in a democratic society (and thus the right to freedom of expression) is seriously misleading. While the motivation for the proposed new right is to help publishers in a time of technological change, the consequence will be a fundamental change in the copyright treatment of news. The onus must be on the proponents of the new right to present independently verifiable evidence on the effects and the proportionality of the intervention (including an assessment of the lack of alternatives). This is entirely missing from the Commission’s package, a scandalous omission. There is consensus, as Recital 31 puts it, that “[a] free and pluralist press is essential to ensure quality journalism and citizens’ access to information”. But it is wrong to present copyright as the solution. Exclusive rights cut two ways. They incentivise and they prevent. Already the Berne Convention for the Protection of Literary and Artistic Works (1886), the ‘mother’ of the international copyright system, explicitly permits free press summaries, recognising the sensitive status of information and news. No evidence is presented by the Commission that restricting the communication of news would address the decline in revenues from advertising and subscription of many traditional newspapers. Will citizens read more, and read more European sources? The second main argument offered by the Commission is that there is nothing problematic or unusual under copyright law to recognise investment through a related right (Recital 32: “the organisational and financial contribution of publishers”). This too is misleading. The contribution of a producer of a phonogram or the producer of an audio-visual recording is very different from a publisher, even a news publisher. Through employment contracts or contracts with free-lance journalists, press publishers already acquire the authors’ copyright. So the proposal in effect establishes a double layering of rights for the same creation. If the real issues relate to licensing and enforcement (e.g. proof of ownership), the answer needs to focus on licensing and enforcement rather than on creating new rights. Article 5 of the Enforcement Directive (2004/48/EC) could be amended to create a presumption that a press publisher is entitled to bring proceedings to enforce the copyright in any article or other item appearing in a journal of which it is the identified publisher. It is false to claim that the proposed new right for press publishers will have no effect on authors who are protected under the “no prejudice” clause in Art. 11(2) (and Recital 35). In the public consultation, journalists and photographers expressed their concern that by granting publishers a related right, the freedom to republish the work (under contract or as a matter of national law), would be even more difficult to exercise. From a user perspective, a service that wishes to republish works covered by the new right will have to approach whom? If the pie does not get bigger, the authors’ share will become smaller as additional rights are introduced into play. The proposal adds another layer of rights that new services and innovators have to clear in all Member States. This will hinder European innovation compared to the rest of world. The empirical evidence from the introduction of ancillary rights for press publishers in Germany (2013) and Spain (2014) indicates that big firms can adjust their business model, pay licence fees or negotiate free licences. The innovation effects on independent news services and start-ups are not assessed by the Commission. There are many technical issues around the drafting language of Article 11. The term of 20 years appears to apply retrospectively, and is never justified. The subject matter is defined very broadly, covering professional publications, blogs and websites. Despite Recital 33 stating that “this protection does not extend to acts of hyperlinking which do not constitute communication to the public” (reasserting case law of the European Court of Justice), the recitals and explanatory documents state the intention to make aggregators, search engines and social media pay. It is unclear for what activity. Non-linking digital uses, such as scanning, indexing, and text-and-data-mining may become a target. There are potential consequences for open data and open access policies. It is no surprise that academic publishers are taking a close interest in the Article. Article 11 is fundamentally misconceived, and should be removed from the Proposed Directive. The Proposal aims to change the legal framework for online use of copyright works. Without acknowledging it and contradicting the results of the public consultation, it reverses the allocation of responsibilities between rightsholders and service providers that was adopted by the European legislator in the E-Commerce Directive (2000/31/EC). The E-Commerce Directive had two main goals. First, it was to support the economic growth of digital services relying on user-generated content by providing them with legal certainty. Second, it was to legislate for rapid, reliable and proportionate enforcement of copyright and other rights. The resulting mechanism adopted for hosting services, known as “notice and takedown”, splits the responsibility and costs associated with preventing copyright infringements between rightsholders and intermediaries. It does so by making a host of content uploaded by users liable only upon obtaining knowledge of the content and its illegality. As a result, while rightsholders bear the burden of identifying and notifying infringements, intermediaries oversee verification and subsequent takedown of the notified content. The proposed Article 13 attempts to change this by creating an obligation on intermediary services to take “appropriate and proportionate measures to ensure protection of works or other subject-matter, such as implementing effective technologies” (Recital 38). The aim is to force platforms into licensing agreements that close the so-called “value gap” between the benefits platforms derive from hosting user uploaded content and the money paid to rightsholders of that content. The Proposal is poorly drafted. It is unclear if it imposes a novel filtering obligation only on platforms with existing licensing agreements, or on all platforms regardless of such agreements. In any case, Article 13 avoids answering the central question: when and on what legal grounds should platforms pay for their users’ content? But most importantly, Article 13 is not based on any assessment of the consequences of the intervention that conforms to “better regulation principles” agreed by Commission, Parliament and Council: a duty to strive “for simple, evidence-based, predictable and proportionate rules that are fit for purpose and deliver maximum benefits to citizens and businesses” (Jean-Claude Juncker, State of the Union Address 2016). In particular, the Commission’s proposals take the “value gap” as given as a rationale for intervention. The idea that the creation of value should lead automatically to transfer or compensation payments has no scientific basis. The concept was invented by the music industry in 2006, initially as a “value recognition right” in the copyright levy debate. This led quickly to reports commissioned from economic consultants that confirm the views of the commissioners. It is disturbing that the European legislator now appears to take the concept for granted. The value gap language also obfuscates the legitimate goal of improving the economic positions of creators. Online service providers that rely on user generated content not only include large multinational companies, such as YouTube or Facebook. There are many European platforms run by SMEs falling into the same category. Innovative companies are the engine of European growth and an important source of cultural diversity. They will be affected by Article 13 in unpredictable ways. We need to know how. During the scrutiny of this proposal in Parliament and in the Council, the following questions need to be asked: (1) why improving notice and takedown procedure is not sufficient; (2) how expensive and available is the crucial filtering technology; (3) how precise is it; (4) can Internet start-up companies afford it; (5) which services are likely to be affected (e.g. cloud hosts, social media, news aggregators, wikis); (6) will the new obligations raise barriers to entry; (7) if so, for which markets, and with what consequences for European consumers and innovators; (8) will new licensing agreements benefit creators, and why; (9) how effective are counter-notice measures in preventing over-blocking of legitimate content; (10) will there be any systematic impact on freedom of expression; and (11) how does the European Commission plan to assure public oversight of these measures. The Proposal appears to require private companies to monitor their customers by using unspecified filtering technologies without any public oversight. It appears to encourage value transfer arrangements without considering innovation, consumer and cultural effects. Article 13 needs radical reform that may not be achievable through amendments within its current structure. We would advise removing the Article from the Proposed Directive, and focussing attention on improving the procedure for “notice and takedown”. This resource has been supported by AHRC grant “Unlocking co-creative possibilities: CREATe follow-on engagement” (AH/P013341/1) and Kretschmer’s Fernand Braudel fellowship at the European University Institute. Please include the date when the resource was accessed.